Prime Rib has to be one of the top dishes that people want to make for any celebration, whether you are talking Thankgiving, Christmas, Birthday or any other celebration. I know turkey is the standard Thanksgiving main course but if you are like my family which doesn’t really like Turkey unless it is sliced thin as deli meat, than prime rib is your best bet as a jaw dropping main course. The problem with making prime rib that scares off 90% of cooks is that it is an expensive piece of meat if you buy the good stuff. For most home cooks we are limited to the type of meat we can find in your standard grocery store which means you only have one of two choices when buying prime rib (Choice vs. USDA Prime). Most standard markets will have these two choices and just to spell it out, choice is half the price of prime but it is also less than half the taste. So the way I see it, if I am going to go through the trouble of making a rib roast, I am definitely going to make the investment into a prime rib roast. 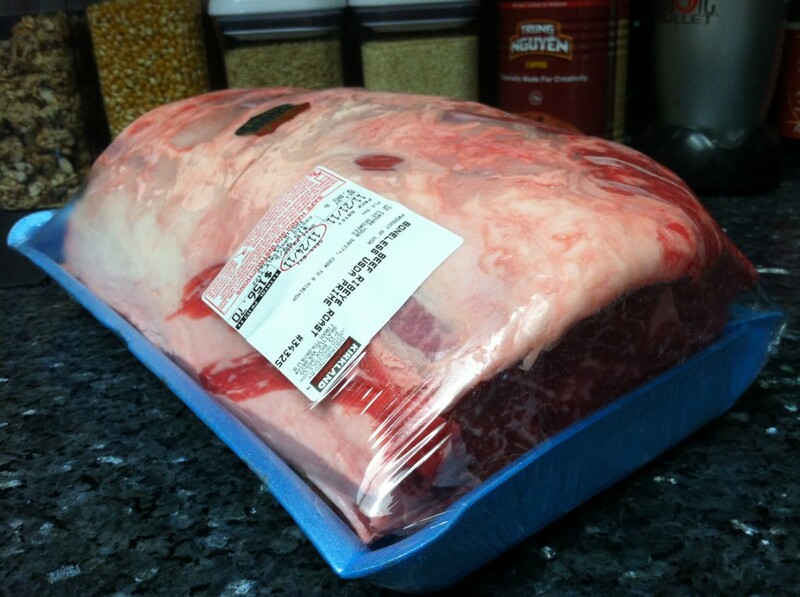 I usually buy my prime rib from Costco.com because it is the only place where I can find a large enough roast. 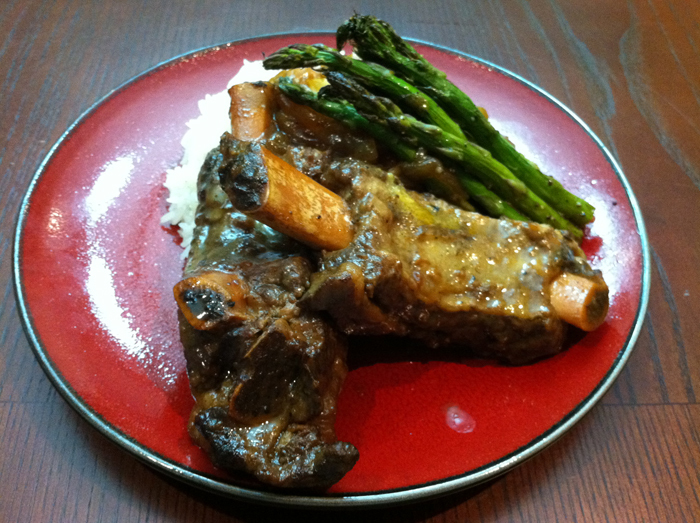 Most markets only carry a 5lb boneless roast because that will feed your standard 6 – 8 people. For Thanksgiving I am feeding about 16 adults so I need a 10lb roast. At costco you can always tell choice meat vs prime based on the color of the package. The white packages are choice while the prime is blue (see picture below). For a 10lb roast at $15.99 per lb we’re talking about $160 and with roughly 16 slices (1/2″ slice) it comes out to a reasonable cost of $10 per slab of juicy USDA Prime Rib (not bad). In case you were wondering, most restaurants that sell you prime rib at $13 – $16 aren’t selling you USDA Prime, they are usually selling you choice. When you buy your roast the first thing you want to do is pat it down dry using paper towel. 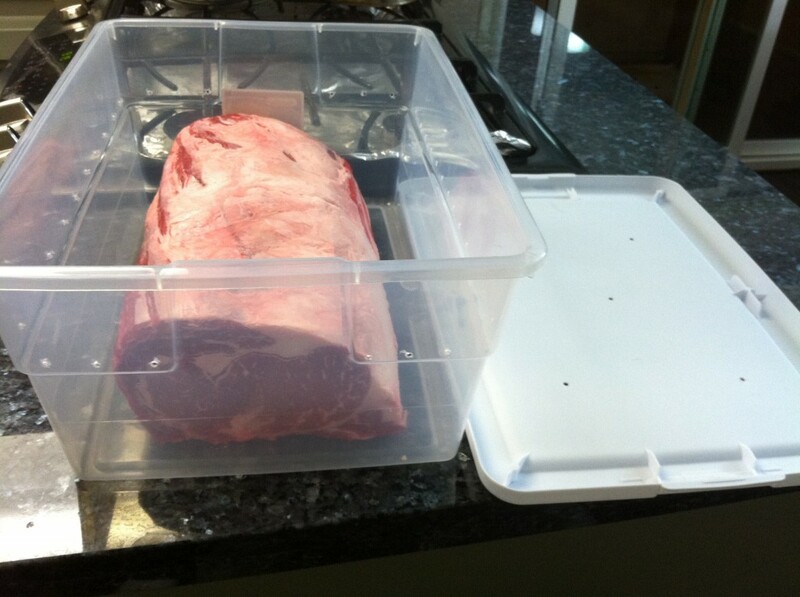 Once it is dry you want to store it in a clean container that will promote good circulation of air. The secrete to awesome prime rib is starting with a good quality piece of meat then dry aging it to bring out the best flavor in the meat. I bought a $5 plastic storage bin and drilled wholes all around the bin. That way when I store the meat in the refrigerator air can flow through and dry out the meat while the bin keeps the meat away from other food. 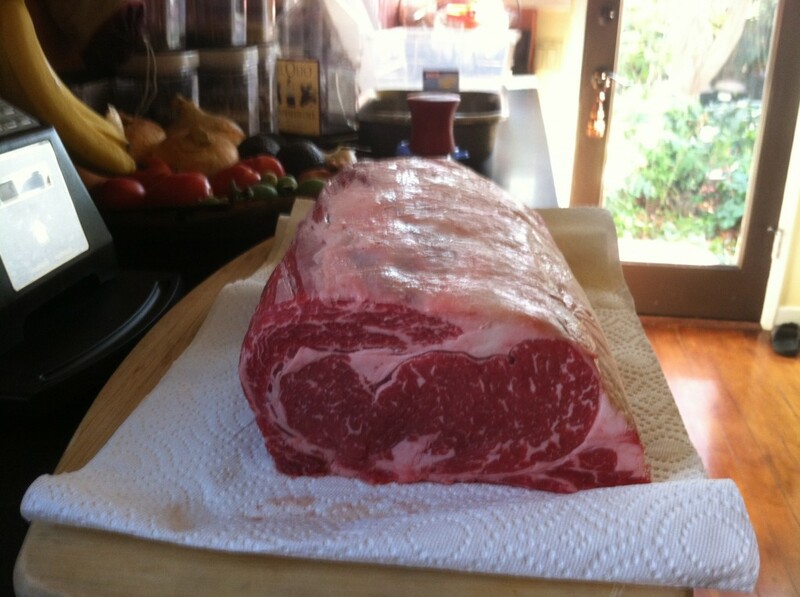 Dry age your roast for 3 – 4 days if possible, 2 at minimum. During this time make sure to not leave your refrigerator open too long, you want to keep the roast under 40 degrees. 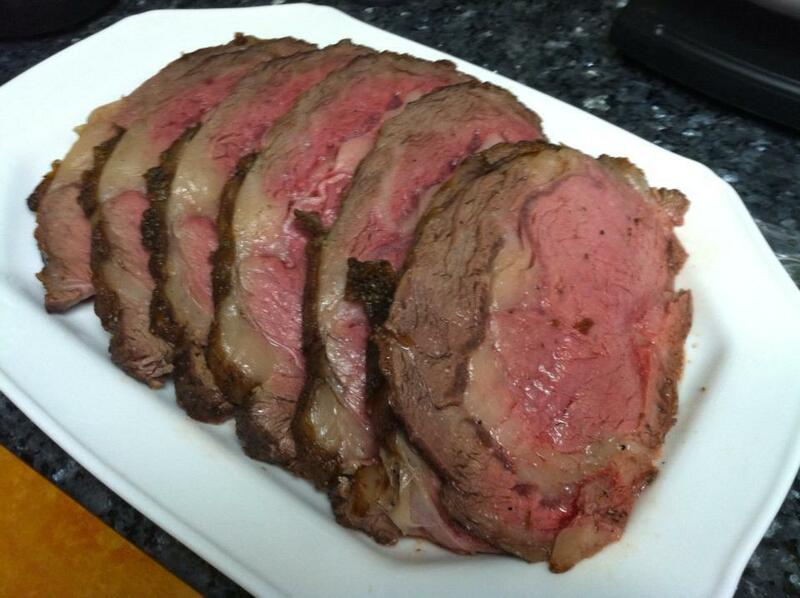 After 4 days your prime rib will get a little smaller due to the water loss and there will be a slight odder. It won’t smell bad (aka spoiled) but the enzymes in the meat begin to naturally tenderize the meat which will create a slight odder. If the surface of the meat starts to get leathery patches then just trim those parts off, but for the most part you don’t have to worry about that unless you age your meat for more than 4 days. 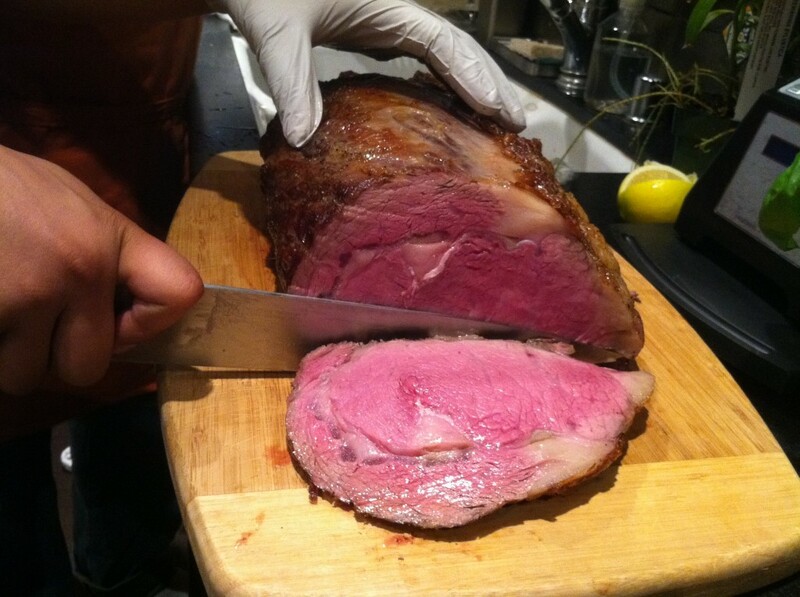 Here are the materials you will need to successfully cook your prime rib: Probe thermometer, roasting pan, baking tray, cooling rack, sheet of heavy duty aluminum foil, cooking oil, kosher salt, black pepper, and a carving knife (or large sharp chef’s knife). Cooking prim rib is a two part cooking method. A lot of recipes say to cooking your prim rib at 400 – 500 degrees to sear the meat then to drop the temperature down to 350 degrees. I find this method to dry out the meat too much. So what I do is I coat my prime rib in cooking oil then cover it with salt and fresh ground pepper. Add a good amount of both because the crust will be crispy and very flavorful to compensate for the middle of the prime rib which will be tender but not so flavorful. 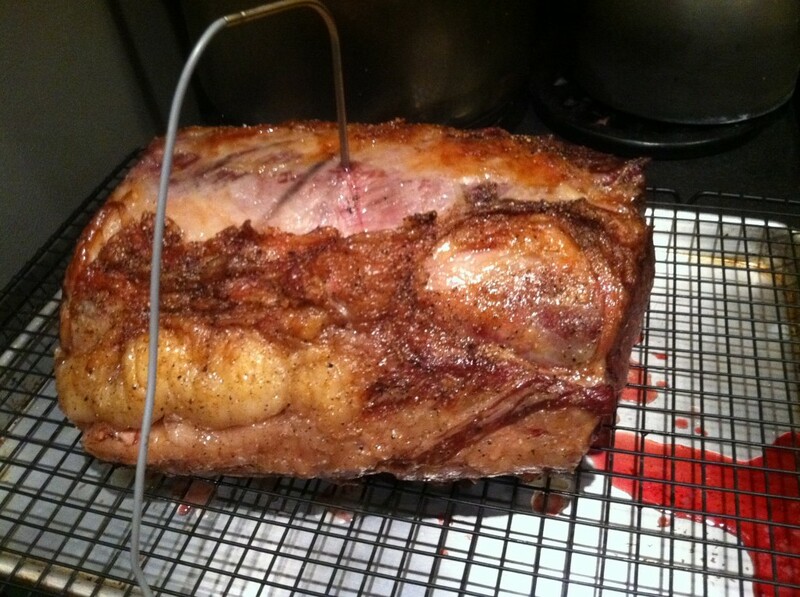 Let the prime rib sit at room temperature for at least one hour. That way the center of the meat will not be too cold, which could offset the cooking time. Preheat the over to 250 degrees and place the probe thermometer into center mass of the prime rib and place the roast into the oven. Turn the temperature down to 200 degrees and roast until the thermometer reads 118 degrees (roughly 4 – 5 hrs depending on the size of your roast). Once the roast reaches 118 degrees take it out the oven and place the roast into the cooling rack (which should be sitting on the baking sheet). 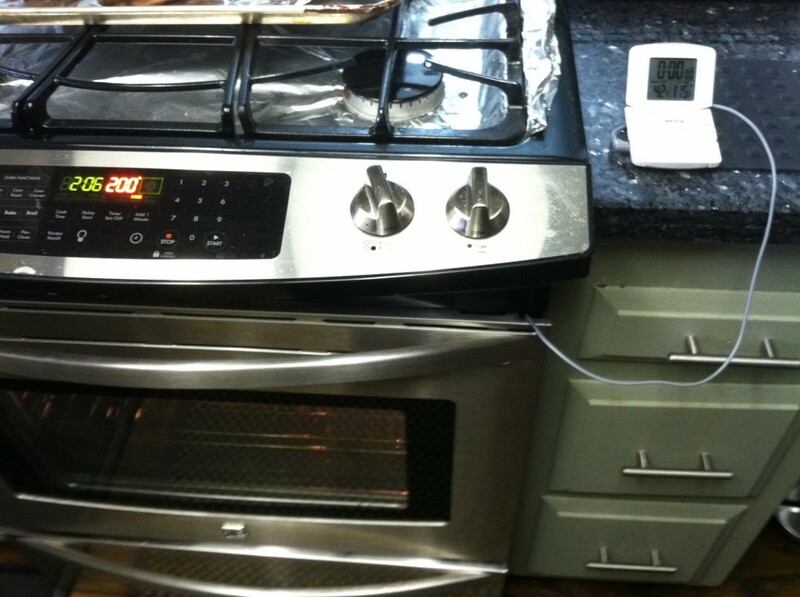 Cover the roast with the heavy duty aluminum foil and make sure you DO NOT remove the probe thermometer. If you remove the thermometer the juices from the meat will rush out. The roast will not have a beautiful crust yet but the low temperature baking will evenly cook the roast and keep it nice and juicy. While your roast rests under the foil the temperature will continue to climb due to carry over heat. So even though you pull out the roast at 118 it may climb as high as 126 degrees. 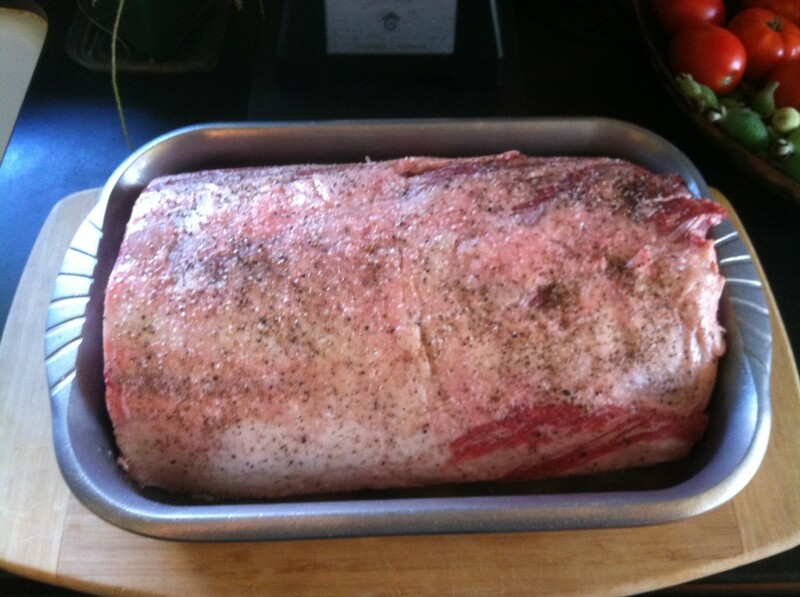 Let the roast rest until the temperature climbs then goes back down to 118 degrees (roughly 20 – 30 minutes). 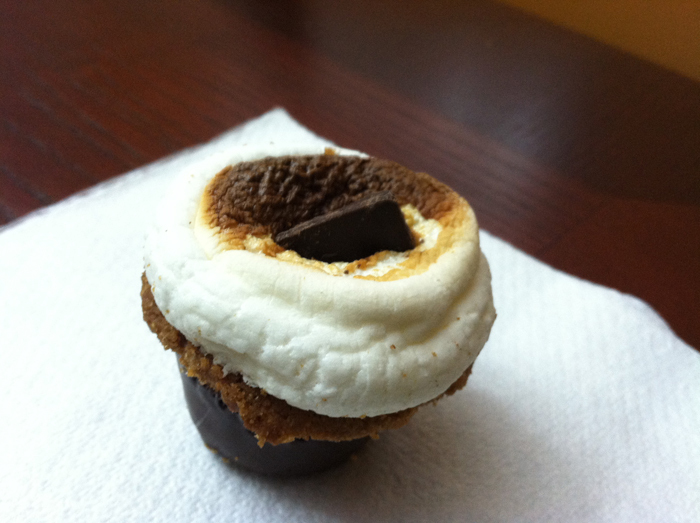 In the mean time turn the oven temperature to 500 degrees. Once the meat temperature drops back down to 118 degrees place the roast back into the 500 degree oven and cook for roughly 15 minutes. I say roughly because you do not want the internal temperature of the meat to pass 126 degrees so if it hits 126 degrees after 10 minutes then pull the roast out of the oven. Place the roast back onto the cooling rack and again cover it with foil. As your roast rests for the second time again the temperature will rise due to carry over heat but it will not rise as much as it did before. The target temperature is 128 – 130 degrees so as your roast rests watch the temperature because if the temperature hits 130 degrees then remove the foil to keep the roast temperature from rising any further. If the temperature starts to drop to 129 than recover the roast with the foil. Make sure to let your prime rib rest for at least 20 minutes before you cut into it. You want to make sure the juices within the meat settle down and redistribute throughout the meat. if you cut into the meat right away the juices will rush out and instead of having a juicy prime rib you will have a piece of dry meat. While the roast rest make the jus (sauce). To do this, take the roasting pan and remove the access meat drippings (oil) but make sure to keep the brown bits at the bottom of the pan. Put the roasting pan on the stove and turn the stove to high heat. 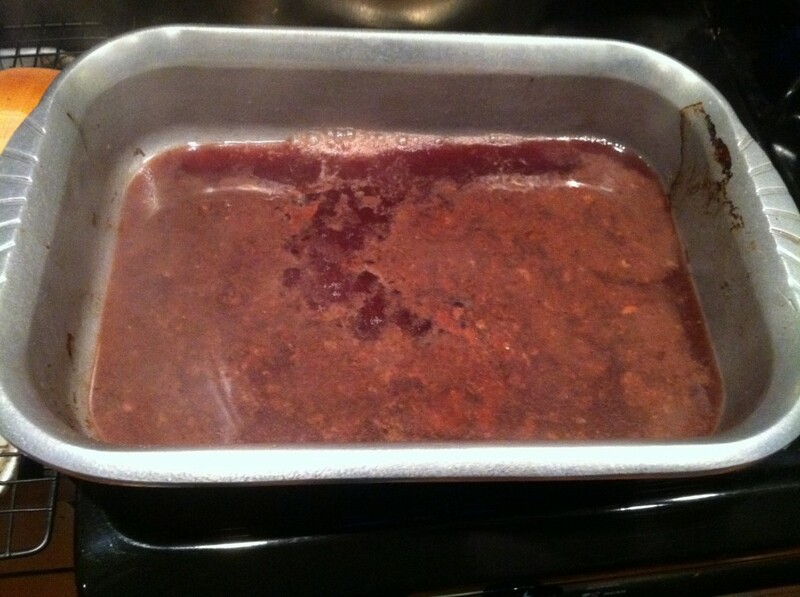 Add 3/4 cup of red wine, 1/4 cut of water and 3/4 cup of beef stock to the pan and deglaze the pan. Use a wooden spoon to break up the brown bits into the liquid and reduce the liquid by half. I usually add some extra flavor with some more fresh ground pepper and some herbs (thyme or sage). After letting the roast rest move it to a cutting board and carve the roast. If you are serving a lot of people than keep the slices somewhat thin (roughly 1/2 inch thick). If you aren’t serving too many people than you can make the slices thicker but I wouldn’t recommend going any thicker than 1 inch. If you are the type that likes your roast to be more medium (aka not pink) than add the jus to your pribe rib slice right away because the hot jus will cook the roast to medium. If you are the type that likes your prim rib exactly at medium rare than do not add the jus until it cools down (just before you eat). 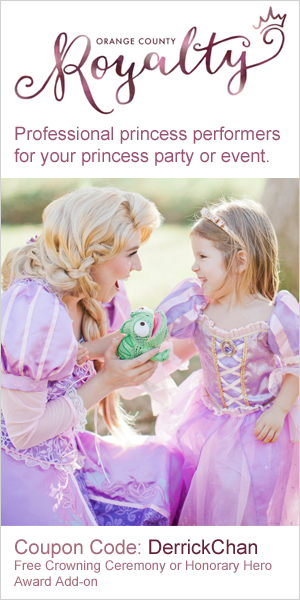 That’s it… enjoy your roast!